I recently gave a keynote lecture to the World Urban Congress in Riga, Latvia, on creative strategies for difficult economic times. The Congress provided a fantastic overview of what is taking place in urban development across the world, but what I saw and heard also left me a bit cold. The same principles apply to cities and their cultural and creative strategies. This isn’t the time to be investing in the urban macro, when the urban micro, specifically, the urban micro-entrepreneurs, are collectively a far more valid and adaptive force for change and revival in this climate. They are the software that’s needed to run the city’s hardware. 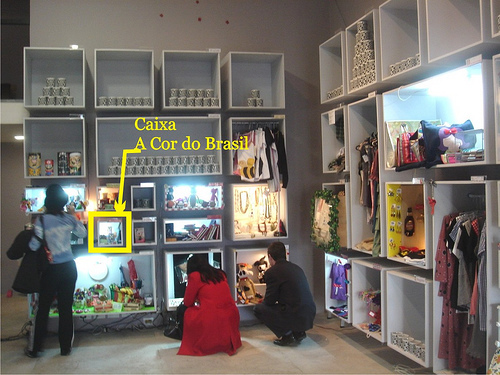 A prime example of how this hardware and software can combine to support the micro-entrepreneur is Sao Paulo’s Endossa. Rent empty shelf boxes to every micro-entrepreneur who wants some space to sell products, without asking for sales commission. Any product can be sold in Endossa from bottles of chilies to handmade notebooks and its time on the shelf depends on demand: high sales means high visibility. Create a micro-community of young entrepreneurs and curious people who visit Endossa to get fresh inspiration from the creative pieces inside the store. In addition to its “real world” benefits, an interesting side effect of the store is its ability to cross-over with online culture. Endossa is an exceptional example of the Focus on the Micro-Entrepreneur strategy. Stay tuned or get in touch for more. grt example with endosa. it’s like bringing etsy.com to the real world in a real possible way. with big creativity, but little money. thanks for sharing.